Stars of the Ashbourne, Purcell and Fr.Meachair compeitions will be honoured in the Hudson Bay hotel Athlone next weekend at a special ceremony. The inaugural joint Colleges All-Star Awards in conjunction with the higher education colleges of Ladies Football supported by the WGPA has now become the most prestigious award a third level Camogie or Ladies Footballer can be awarded. The joint Colleges All-Star Awards will be a collaboration between the higher education colleges of Ladies Football and Camogie. The award acknowledges the outstanding individual performance by a player throughout the Colleges season for their skills, commitment, attitude, teamwork and work rate. On the night players from 9 counties will be represented including premier junior team Kerry, where Patrice Diggins will be awarded for her phenomenal performance with UL this year. Cork dominate the team with five awards with Cork senior stars the Mackey sisters collecting more silverware to their collection. The All-Stars will be presented on May 14th at 7pm. Tickets are available for €30 on the door or email annmarieguinan2012@gmail.com . 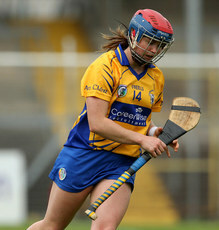 This entry was posted in News and tagged all stars, Camogie All-Stars, Third level camogie all-stars by CCAO PRO. Bookmark the permalink.